One of the most popular trolling reels of all time, Penn's dependable Level Wind Reel with Line Counter is ready for a fight. Built lightweight and durable, this Penn Reel's extremely accurate line counter makes finding the strike zone quick and easy. With a price that can not be beat and power to spare, this Penn Level Wind Reel is perfect for stripers, salmon and other hard-charging gamefish. Because this reel is new, we don't have any actual customer feedback yet. We will add feedback and comments as soon as they become available. 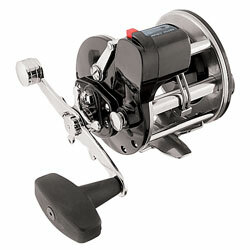 Because this is a new reel model, we were unable to find any customer feedback yet. Please check back soon for new customer reviews and comments.